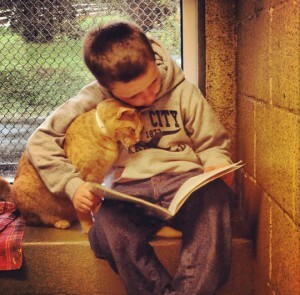 This has got to be the best way to make the experience of reading special: kids reading books to cats in shelters! The article and accompanying photos say it all. As one of the boys said in the article, the cats aren’t judging how well he reads. Perhaps we can all learn to do that for our kids! Here’s the article I’m referring to: Kids Reading to Shelter Cats. Check out all the photos in the above article. It’s sure to warm your heart!